Two routine injections that have to be given by owners involve the administration of insulin in the treatment of diabetes mellitus and administering allergenic extract injections to control skin allergies. Your veterinarian will review the technique but the following questions and answers may be of help. Most pets don’t seem to mind routine injections. Single-use needles ensure that a very sharp needle is used each time. Your veterinarian will prescribe appropriate needles and syringes based on your pet’s needs. What happens if my dog moves when I give the injection? Ideally, have someone assist you while you give the injection. Try offering the pet a treat as a distraction while you administer the injection. By injecting quickly, you can minimize your pet’s movement. 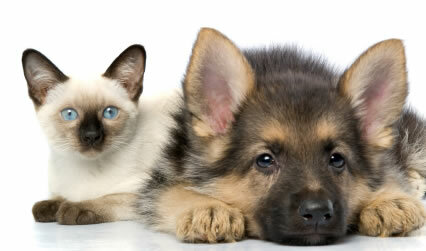 Most pet owners find that their pet becomes cooperative for these life-sustaining injections. Is there any danger if he doesn’t keep still? Most owners are concerned that they may break the needle off but this is extremely unlikely. The needle may bend but it is much more likely that the injection may end up outside the pet rather than inside. If you are unsure if your pet received the full amount of injection, contact the hospital for instructions. As a general rule, if you’re unsure how much you injected, do not administer more unless directed by your veterinarian. Can you explain the exact technique of giving an injection? Subcutaneous injections are placed just beneath the skin, which is considerably looser in the dog than in humans. Your veterinarian may advise swabbing the skin with alcohol to clean and sterilize it prior to injection. Pinch some loose skin from the back of the neck or “scruff” region between your thumb and forefinger. The syringe is usually held like a pencil with the other hand. The needle is inserted swiftly into the fold of skin, keeping the barrel roughly level with the fold of skin but with the needle angled downwards. Most injections are given in syringes small enough to allow the plunger to be depressed with the palm of the same hand once the needle has been positioned. Administer the contents of the syringe quickly. Once the injection has been completed, the needle is quickly removed and the area gently massaged. Having someone assist you will make the procedure easier. With a little practice, however, most pet owners find that they have no problems administering routine injections to their pet loved ones.